Last month we noted that the Monsters University Blu Ray was now available to pre-order on Amazon. Today, we now know the official Blu Ray release date for Monsters University...and a re-release of the first Cars movie in 3D. Amazon has recently listed the official Blu Ray release dates for both movies as October 29 for North America and November 25 in the UK. Additionally, and perhaps more excitingly, is that Monsters University will also be released in Digital High Definition (2D & 3D) on October 8 (just two months away)! Scare Games – At Pixar, we play hard while we work. The same people who keep the film production moving – producers, managers, coordinators and artists – are also the ones who bring spirit and excitement to some of our extracurricular activities. We check out the MU production teams as they go head to head in the mostly playful Pixar Scare Games competitions. A sample of this feature has previously been released on YouTube and can be seen on our post here (the extra in the movie is much longer). Monthropology – This takes a close look at the monsters themselves and how they are comprised of different shapes and how their different controls create varied emotions. It also takes a look at the arduous process of creating the character of Dean Hardscrabble. The Blue Umbrella – This animated short film from Pixar Animation Studios, directed by Saschka Unseld and produced by Marc Greenberg, played in theaters in front of “Monsters University.” “The Blue Umbrella” tells the story of an evening commute in which the rain starts to fall and the city comes alive to the sound of dripping rain pipes, whistling awnings and gurgling gutters. And in the midst, two umbrellas—one blue, one not—fall eternally in love. I am very excited to see the extras - Story School, Color and Light, as well as Paths to Pixar. Obviously I'll be excited to see them all, but those are the ones that initially jumped out to me. We were surprised to learn that the short film, Party Central will not appear on the Monsters University blu ray, but will instead be released in theaters with The Good Dinosaur! 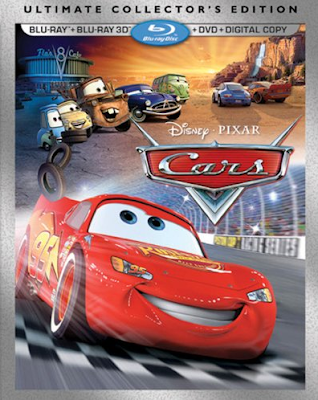 A listing for the Cars 3D Ultimate Collector's Edition has also listed for release on October 29. This would mark the first time that the original Cars movie has been made available in a 3D format - Even the massive 11-disc Cars Directors Edition didn't contain the 3D version of Cars. You can pre-order the Cars 3D Ultimate Collector's Edition on Amazon now.